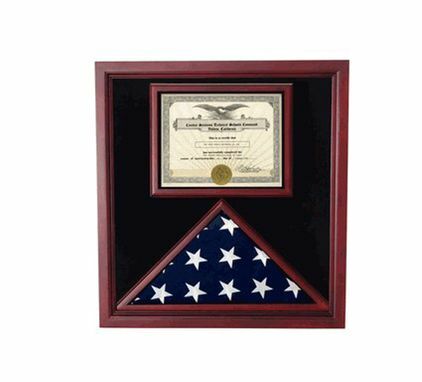 This beautiful Cherry Flag and Document Case will hold 5 x 9.5 flag or 3' x 5' flag in the flag case and a 8 1/2" x 11" document in the document holder. It has a glass front and black lining for an elegant touch. This beautiful Cherry Flag and Document Case will hold a 5x9.5 flag as well as 3' x 5' flag in the flag case and a 8 1/2" x 11" document in the document holder.